Manchester; a city of music, knowledge, politics, and sport; the industrious beating heart of northern England and epicentre of some of mankind’s greatest achievements. Alright, perhaps I’m a tad biased; I grew up twenty minutes outside the city, went to University there and have many fond memories of gigs, football matches and nights out. 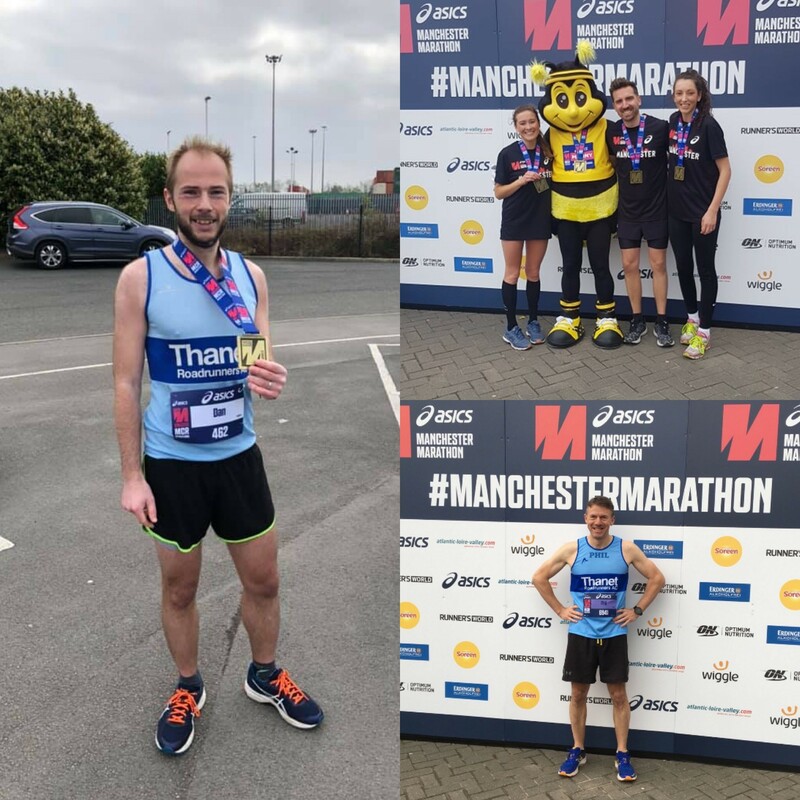 It’s no surprise therefore that I’m equally fond of what is billed as the UK’s “flattest, fastest and friendliest marathon” – the ASICS Greater Manchester Marathon 2019. This was my third year in a row running the Greater Manchester Marathon, but my first representing Thanet Roadrunners. I wasn’t alone either; fellow Thanet Roadrunners Abigail Cardwell, Andrew Richardson, Jasmine Lasslett, Simon Cowdery and Phil Stevens were all there too. I made my way into Start Area A, did some stretches and enjoyed the shelter and warmth of hundreds of other people. It wasn’t long before the starting gun went off and I was shuffling towards the start gantry. The route starts beneath the Trafford arch and heads towards the city centre before an abrupt right turn through the Trafford streets. The first couple of miles are (slightly) downhill, so you get a bit of a free ride before you hit Chester Road and begin the long drag in towards Sale. I’d started reasonably well and was just a shade ahead of the three-hour pacer. My intention was to get as close to three hours as I possibly could. Leaving Sale, the route follows the long and seemingly endless Brooklands Road towards Timperley and Altrincham. The crowds were out in force through Altrincham. At mile 12 you encounter the only real ‘hill’ on the course as you meander through Altrincham town centre and over the railway bridge. A folk band whipped up the crowds in the town centre. Around this section of the route there are some short portions where you run in parallel against other runners. I tried to keep to the right in the hope I’d see some of my fellow TRACies, but it wasn’t to be. I did, however, see two chaps in Folkestone Running Club vests wiz past me; I recognised that one of the chaps was Dan Voller. I managed to catch up with them and we chatted for a few minutes. It was clear they were both making serious sub-3 hour attempts and they pushed on. This year’s route differs slightly from last year in that, leaving Timperley, the route bears to the left along Park Road. In some ways this is a positive change as in previous years you’d be running back along Brooklands Road against the slower runners. At around mile 16 I could feel myself starting to wane. I’d been holding a very consistent pace but I was finding it harder and harder to maintain it. Rather than focus on the next ten miles, I instead told myself to maintain the pace until mile 20; my thought process being that if I could hit mile 20 before 2 hrs 15 mins, I’d have done enough to ease back just enough to hit three hours. Leaving Carrington, the bridge over the River Mersey is a welcome relief as, from now on, the route meanders its way back into the city centre. The support begins to build again in Flixton and Urmston, and then gradually gets louder and louder as you approach Stretford. This section of the route was brutal for virtually everyone around me, people were walking, being sick, stopping to stretch away cramp… I had to ignore the overwhelming urge to stop. I kept reminding myself that I had a week in the Lake District to look forward to immediately after the marathon… “two more miles and there’s a pint waiting in Buttermere”, I kept thinking. The final left turn back onto Trafford Road is always a joy as you can see finish area appear in the distance. The noise on this section is unbelievable. I managed to pick the pace up enough to keep a PB on the cards. Slowly but surely the finish gantry got closer and closer. As I entered the finish funnel I punched the air…I may not have achieved the sub-3 hour I was after, but I’d still got myself a PB… 3 hours 5 minutes and 45 seconds. Congratulations to all of the runners, particularly Abigail, Jasmine, Andrew, Simon and Phil. This was Abigail, Jasmine and Phil’s first marathon, and that’s some achievement in itself. Added to the fact they all achieved such amazing times it was a great day for Thanet folks! Simon said it was best run ever and he even managed a negative split. Phil said he was so happy with his time for his first ever marathon. Abigail and Jasmine said that they’re over the moon with their times. This is a brilliant marathon; the support is phenomenal, it’s so well organised and the route is great. I’ll be back next year!